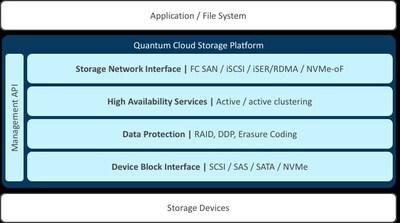 SAN JOSE, Calif., April 4, 2019 /PRNewswire/ -- Quantum Corp. (OTCPK: QMCO) today announced the F-Series, a new line of NVMe storage arrays designed for performance, availability and reliability. Using non-volatile memory express (NVMe) flash drives for ultra-fast reads and writes, it supports massive parallel processing and is designed for studio editing, rendering, and other performance-intensive workloads utilizing large unstructured datasets. Incorporating the latest Remote Direct Memory Access (RDMA) networking technology, the F-Series provides direct access between workstations and the NVMe storage devices, delivering predictable, fast network performance. By combining these hardware features with the new Quantum Cloud Storage Platform and the StorNext® file system the F-Series delivers powerful end-to-end storage capabilities for post-production houses, broadcasters, and other rich media environments. Tom Coughlin, President, Coughlin Associates: "NVMe-based solid state drive solutions are making their way into modern workflows to support the performance demands of 8K+ high frame rate video production. Quantum's F-Series provides a valuable contribution to this transition to NVMe solutions. Combined with StorNext and its out-of-band metadata management, the F-Series provides storage tiering, content protection and diverse software defined management capabilities that should be well received by the media and entertainment industry." Jason Paquin, Chief Executive Officer, Chesapeake Systems: "With 4K being the new normal, and 8K coming on the horizon, NVMe enables creatives to prepare for the future while keeping infrastructure costs under control. Quantum's F-Series NVMe appliance could be the silver bullet media production houses have been waiting for to solve the performance problem posed by 4K and UHD workflows." Jamie Lerner, President and CEO, Quantum: "This is the most significant product launch we've done in years, not only because our F-Series product line will enable our customers in media to produce more great hi-def content faster over IP networks, but because the F-Series is the first product line based on the Quantum Cloud Storage Platform. This platform is a stepping stone for us and for our customers, to move to a more software-defined, hyperconverged architecture, and is at the core of additional products we will be introducing later this year." "Safe Harbor" Statement: This press release contains "forward-looking" statements. All statements other than statements of historical fact are statements that could be deemed forward-looking statements. Specifically, but without limitation, statements relating to Quantum's F-Series products including the F2000, and Quantum's customers' potential purchase of these products, are forward-looking statements within the meaning of the Safe Harbor. All forward-looking statements are based on information available to Quantum on the date hereof. These statements involve known and unknown risks, uncertainties and other factors that may cause Quantum's actual results to differ materially from those implied by the forward-looking statement, including unexpected changes in the Company's business, the potential impact to Quantum's business of Quantum not being current with its SEC periodic filings, and the potential impact to Quantum's business on the results of its previously announced restatement activities and the financial results ultimately reported by Quantum for the fiscal periods covered by the restatement and for those fiscal periods not yet reported. More detailed information about these risk factors, and additional risk factors, are set forth in Quantum's periodic filings with the Securities and Exchange Commission, including, but not limited to, those risks and uncertainties listed in the section entitled "Risk Factors," in Quantum's Quarterly Report on Form 10-Q filed with the Securities and Exchange Commission on November 9, 2017, especially those risks listed in this section under the headings "Our results of operations depend on a limited number of products and on new product introductions, which may not be successful, in which case our business, financial condition and results of operations may be materially and adversely affected." Quantum expressly disclaims any obligation to update or alter its forward-looking statements, whether as a result of new information, future events or otherwise, except as required by applicable law.